Two men could face prison after admitting stealing 13,000 snowdrops from the grounds of a medieval abbey. Stefan Simpson and Peter Gibbs, both 30, dug up the valuable bulbs at Walsingham Abbey, Norfolk. Simpson, from Wisbech, Cambridgeshire, and Gibbs, from Newton, near Wisbech, pleaded guilty to theft and criminal damage at King's Lynn Magistrates Court. They will be sentenced at Norwich Crown Court at a later date. A third man - Louis Stoker, 22, from East Winch, Norfolk - was conditionally cautioned following the incident. Simpson, Gibbs and Stoker were arrested on the A148 at Little Walsingham at about 02:00 GMT on 13 March after the snowdrops were reported missing. Police found sacks containing thousands of bulbs - worth approximately £1,500 - in the back of their car. They have since been replanted. 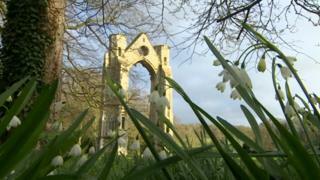 Walsingham Abbey is famed for its snowdrops, which carpet the grounds of the 18-acre estate at this time of year. It is thought the bulbs had been stolen to sell on. The maximum penalty for the theft is six months.